1. 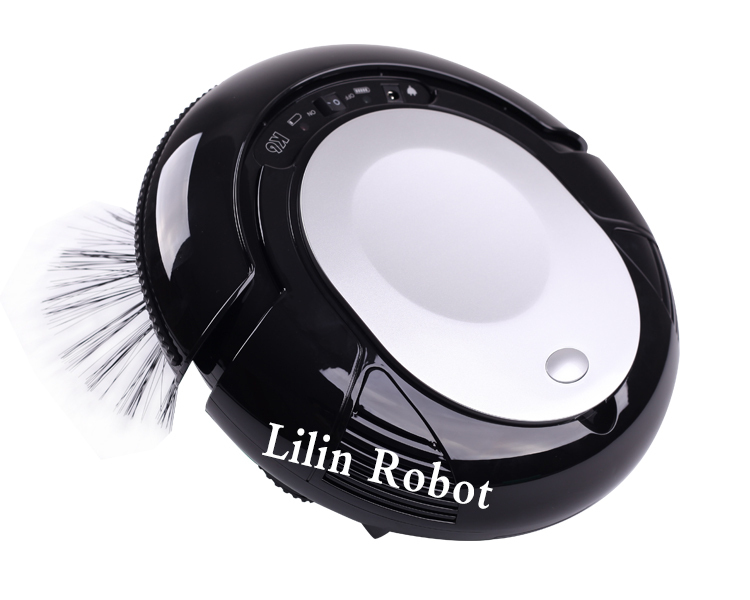 Mini robot vacuum cleaner, with Elegant design, practical and convenient. 2. Be competent for wood floor, vinyl floor, ceramic tile and other.hard floor. 5. Two side brushes help to pick up the dirt efficiently, which make vacuuming more easily. The brushes are not easy to be wound by hair. The brushes are replaceable easily by hand. 6. Intake closer to the ground, make better cleaning, cotton, hair, and even rice can be inhaled. 7. The dust bin is convenient for taking out, dumping the dirt is easy. Hands are not easy to be stained.Reusable electrostatic filter, affordable, environmentally friendly and healthy. 8. WIth Electrostatic dust paper, the mini robot can do both vacuuming and mopping job. 9. With flexible front bumper, it will turn cleverly when encountering obstacles. 10. Safely power off function: if the wheels stuck off, it will shut off automatically, which is safe and energy saving. 11. Removable wheels and brushes design.